The exterior of your home makes a first and lasting impression. When visitor's come to your home, your front door should greet them with elegance and warmth. At Precise Windows & Doors we offer a variety of replacement doors that beautify your home, increase your home's energy efficiency, add to the 'Welcome Factor', and provide you with a front door that will last a lifetime. We can provide you with the perfect solution for your front door to ensure you'll love the look of your home, and will maximize curb appeal. We will help you find the right door that meets your taste, complements the exterior of your home, increases your home's energy efficiency, and fits your budget, we guarantee it. But it doesn't stop there. In addition to helping you find your front door solution, we will expertly install it for a look that will last a lifetime. We feature a variety of styles that can be customized for your home. French doors, vinyl sliding patio doors, elegant entry doors, are some of the popular styles. Fiberglass insulated doors, Steel Doors and even Wood Replacement Doors are available for you to chose from. You can also select from our choice of pre-finished doors that come with warranted factory finish colors. We install the very best pre-hung, entry doors you can chose from for residential replacement door projects. Entry Doors - Enhance the appearance of your entryway with our beautiful and highly efficient custom steel and fiberglass entry doors. The choices are endless! Select from some of our many custom entry door styles and glass collections available for your home. Whether you're looking for steel or fiberglass, all of our entry doors come standard with quality features that are ranked amongst industry best in strength, durability, and operation. Security Storm Doors - Provide your family with peace of mind behind the strength of our heavy-gauge ornamental steel security storm doors. It's not just about security! 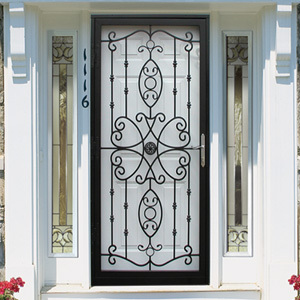 As you can see, beauty is not sacrificed when you select from some of our many custom ornamental security door styles. All of our security storm doors come standard with quality features that are ranked amongst industry best in strength, durability, and operation. 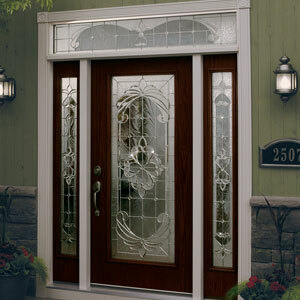 Decorative Storm Doors - Few areas of your home deserve the attention that your entryway does. Choosing the right storm door for your home is made easy with ProVia. Their storm doors excel in Beauty, Durability, Security, and Energy Efficiency. Visit our showroom and discuss your door project with one of our professional sales associates.